Home News Is Villa Park Heading for a Low Semi-Final Attendance? Is Villa Park Heading for a Low Semi-Final Attendance? It’s less than two weeks to the do-or-die second leg of the League Cup semi-final vs Bradford City, when Villa will attempt to turn around a 3-1 deficit against the League Two team. Today it was announced that Bradford had sold out its 6,500 allocation. 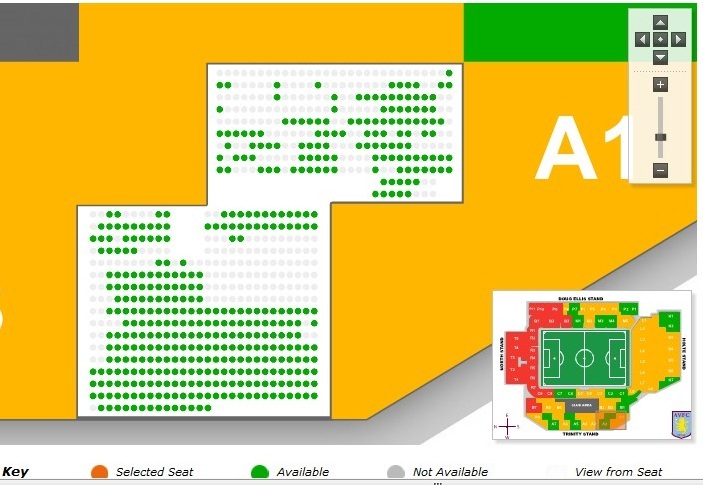 Tickets for the home fans are now on general sale (following season ticket and booking history allocation), but there seems to be a way to go to get Villa Park over the 40,000 mark (see diagram above)- the kind of attendance fitting for a semi-final. While the lower league nature of Bradford City might have put a few punters off buying a ticket so far, the Bantams fully justified their semi-final place with a convincing win at Valley Parade in the first leg. As the list above shows, this isn’t the first time Villa have faced lower league opposition at the semi-final stage. If you were at the Tranmere Rovers match like myself, you’ll know you witnessed one of the truly great games for drama in Villa history. The Chester game in 1975 too was a tight epic – Villa won 5-4 over the two legs. 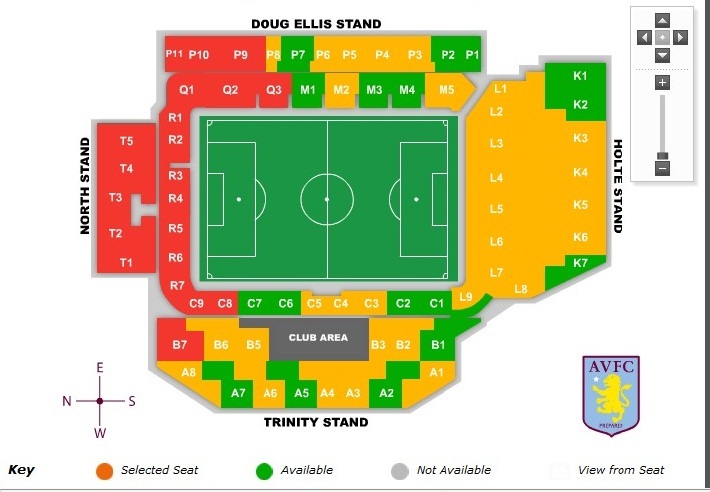 The dark side (Lower North Stand) is sold out though and those Villa fans will be very much on the front line, sandwiched between Bradford City fans to their left in the Doug Ellis and also above them in the Upper North. They’ll have a key role to play in responding to the away supporter’s noise. The Holte End will no doubt come good in terms of selling seats; the Lower Holte has mainly single seats left, although there’s still a bit to go to fill the wings of the Upper Holte. What is more worrying from a home atmosphere point of view is that both the Trinity Road stand and Doug Ellis stand have blocks of seats still available. Villa ticket sales will certainly receive a boost if the team ups their game in the league before the semi, with the Saints at Villa Park and the derby at the Hawthorns to come. There’s a big difference between Villa Park having an attendance of 35,000 compared to it being over the 40,000 mark. Remember, Bradford will be bringing 6,500 loud fans. In a games like this and trailing 3-1, we’ll need a full house to roar the team on and hopefully turn it into a vintage Villa Park night. Update – The Holte End is just about sold out, which is great news, as we’ll need its full power. Shame that Trinity and Doug had £39 ticket prices, as I’m sure, even if they were £4 £5 less, the whole ground would have been sold out by now. What a disgrace. 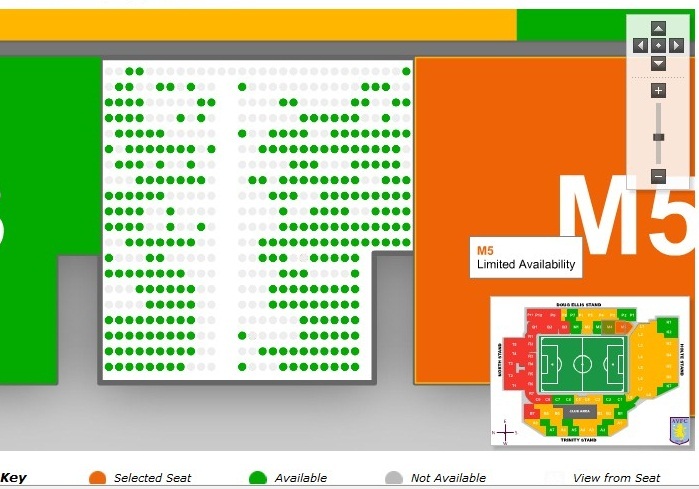 If we turn this round we won’t have any trouble selling out Wembley though will we. Personally I wasnt going to go, living in Norwich I thought it’d be too expensive but partly thanks to finding some cheaper train tickets but mainly thanks to this article I’ve had my arse well and truly kicked into gear. Our team needs us. If we can’t at least get near to selling out a cup semi final at our own ground it is truly truly shameful. *Post amended – table and title were added later to piece and were out of sync with tone of text, plus table had an howling error! Also, Leicester in 2000? Bolton 2004? The Holte wasn’t redeveloped in ’86. It was demolished at the end of the season in ’94. And what about the Bolton Semi Final in 2004 with less than 37,000 or the Semi Final against Leicester in 2000 with a 28,000 attendance. Holte1966 Yep, that’s what I thought, since I stood on it enough post-1986. Sorry, the young chap who made the post was a bit puzzled at the low attendance and thought it was due to group redevelopment. I think he knew the last game with a terraced Holte was against Liverpool, and when he was checking saw Villa played Liverpool last game of the 84/85 season. Although, if he’d looked at that closely, that game was at Anfield! I kind of understand that mistake, although the title of the post is totally wrong! Holte1966 Regarding the admission of the Bolton & Leicester semis – the brief was to include the recent ones that Villa won – the significant ones. Although, I think I might now just add them all W or L, just for the record. How come you’re not showing the 1971 semi against Man U there when there were 65,000 of us in the ground? jonah127 It was meant to be more recent ones that Villa ended up going to the final, but I’ll add this and make it post-1970’s. Cheers. NOW ARE WE SURE THIS WONT BE A SELL OUT OR NEAR SELL OUT!! !, INSTEAD OF COMING OUT WITH RANDOM CRAP LIKE THIS TOPIC, COME UP WOTH SOMETHING USEFUL TO TALK ABOUT. Figures show we have sold 13,000 since Monday. Holte End Centre is sold out as is North Stand Lower while there are only single seats available in Holte End Lower. TheDukeB90 Which is great news! TheDukeB90 I think you got the wrong end of the stick. It was stating facts and it’s inspired some fans to get tickets and travel along way to back the team. It was a call to arms. We all want a full house on the night. Bradford will bring 6500 loud fans, so Villa Park needs to respond to that.